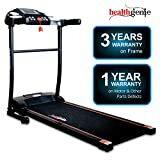 Best Treadmills India – How to choose the best treadmill for yourself - Top 10 In India - Only The Best of everything! LATEST product list, updates regularly! Treadmills are a great way to exercise, whether you are a stressed out corporate worker or a housewife or a youngster wanting to get high levels of fitness. In most homes today going for a jog in a park is quite a difficult task. For one, the number of parks have drastically reduced everywhere and also making the effort of going to one can be too much for many of us. Imagine coming back from office after a long commute and then getting dressed to go to a park and again driving to get to the park. Sounds very difficult. In most cases a treadmill is a great option to keep yourself fit. Treadmills are available in essentially two types – Manual Treadmills and Electronic Motorised Treadmills. 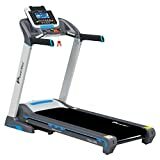 The Manual Treadmills are cheaper, and are available in the range of 7000 to 10000, and require you to use your own body strength to move the running belt of the treadmill. That means you have to push against the deck of the treadmill to get it rotating. This is not easy and you will need to put it an incline to start moving it, and then stick with that incline throughout your exercise routine. 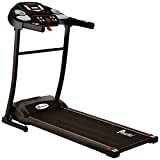 Manual treadmills are much cheaper and do not need electricity, however, overall they are not as effective or beneficial as electronic treadmills. Manual treadmills can stress out your muscles as you have to move the entire contraption with your own muscle power. There are more chances of injuring your joints because of the stress you subject them to. Also there are very few options like programmes and monitoring in manual treadmills. Another disadvantage is that the manual treadmills are not as strong and robust as electronic treadmills, so they are not able to take too much of wear and tear. That is why they can be used more for walking than for running. 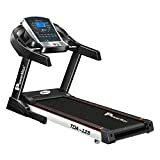 Electronic treadmills on the other hand have a motor that powers them so you can run or walk more naturally, and without stressing out your muscles and joints. They also come with many more options like incline levels and programmes etc. You can change the speed, the incline and monitor many things related to your running or walking exercise on it. 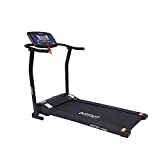 It is our strong suggestion to go in for an electronic motorized treadmill even though it costs more as that is the one that you will end up using. The electronic treadmills come for anywhere between Rs. 25000 to up to a couple of lakhs. There are several things that need to be kept in mind when choosing a treadmill. First off, you need to be sure of how much space you have in your home. If are short of space, you can take a folding treadmill, though they cost more. Next you need to get a treadmill that is robust enough for your needs. You can either be a moderate user of it or a regular user and you also need to consider how many people will be using it. If more people will use it, then its daily usage will be much higher and you need to take that into account. Since the treadmill is going to be an investment in your part, you will want it to be working perfectly for a few years at least. That’s where warranties come in. You should look for a treadmill that has about 5 years of warrantyon the motor and 2 years warranty on the parts. Another thing you may want to consider is how noisy the treadmill is. If you plan to watch TV while running in the treadmill, it needs to be a relatively silent one. The add-ons can also be a thing to consider. You can opt for a treadmills that has multiple programmes and user profiles, or has a heart monitor or a cup holder etc. etc. As you keep adding on things the cost will increase but since you are making an investment you might as well get one which has everything that you need so that you end up using it the most. These are a few pointers that will help you choose the right model. 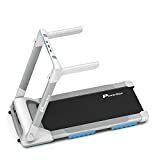 These points and the figures mentioned are a good place to be in, and will mean you have an efficient and sturdy treadmill that will fulfill your needs. Motor specs – You need to look at something known as the Continuous Duty Rating, and it should be in the range of 2 HP. Anything between 1.5 and 2.5 HP will be good to go with. Running Belt Size – A good size to go for is length of 48 inches and width of 18 inches. Speed and incline – Aim for a treadmill offering 15-17 kilometers per hour speed, and an incline level of 20 degrees. Warranty – 5 years for the motor and 2 years for the parts. Important Safety Features– Must have Emergency Stop mechanism. This list of the top 10 best treadmills in India is a continuously updated list, which features the latest and top bestselling treadmills in India. This list is updated every day and it features products that have been bought and tested by hundreds and thousands of Indians already. 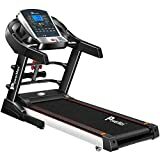 These battle tested treadmills will deliver the best value for money for you, and also bring you only the latest and best treadmills. As you can see int he list below the top most popular treadmills are the manual treadmills, and that is because they cost much less. However, when you choose one be sure to consider that disadvantages of a manual one when compared to an electronic treadmill. Since you will be choosing from www.top10in.in, you will get reliability and of course the 30 day money back guarantee from Amazon India (read the details on this carefully though, whether it is exchange or return etc.). Go ahead and choose from the Top 10 Best Treadmills in India! Speed Range:1.0-16 km/hr | Vertical Hydraulic Folding System for easily moving and storing the Treadmill | Lubrication: 100% Silicone Oil provided in package | Emergency stop key with smooth stop system | Dura-Spring Technology & Gel Cushion for additional Shock-Absorption. Warranty: 1 Year Door-Step Warranty on parts & 3 Year Door step warranty on Motor, against Manufacturing Defects via DuraProtekt | Treadmill is 95% preinstalled and can be installed in 30 minutes. We provide Online Installation Support to all customers | Option of Installation Service from our Authorised Service Partners from our Pan-Indian Service Network. DIY Installation : Healthgenie 3911M Treadmill comes in 90% assembled state. Tools and fittings are provided for Do-It-Yourself installation. Installation video available in the image tab and on official YouTube channel of Healthgenie India Pvt Ltd.
Running surface (L x B): 1100mm x 395mm (43 inch x 15 inch) & Maximum User Weight: 100 kgs. Easily Foldable to maximize the space usage.